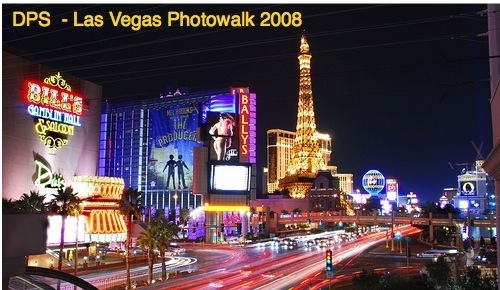 Last Friday DPS had its first ever photowalk in Las Vegas. I’ll share some shots from those who attended next week – but one of the ways that the walk challenged those who attended was that they were taking shots at dusk with the end of the walk happening in fairly dark conditions (or as dark as it gets in Vegas). The following video tutorial gives some night photography tips for DSLR owners. I hope you enjoy these night photography tips – produced by the team at DSLR tips. Exactly what I was thinking. I love dPS and this blog contains many great tips, but I was extremely disappointed with this post. Just two tricks, eh? Getting as much light into the camera I would agree with, and keeping the camera steady. Sure. But frankly these are two 'tricks' that you should use all the time. Not enough light? Dark picture. Not holding the camera steady? Shake. Not just 'night' issues but photography issues. Night photography does not have to be all about long exposures, which is the main issue I have with this guy's presentation. No photography is 'all about' any two things. At the very least it is 'all about' three things; ISO, speed and aperture. He obviously mentions opening the camera aperture as far as it goes which, with most consumer DSLRs and their kit lenses is where the limitation is, as most have variable max-aperture lenses that, as soon as you go 1mm past the wide angle setting, start closing the aperture down, usually to around 5.6 by the time you are zoomed in. I shoot a lot of night photography. I typically shoot at 400ASA and usually no slower than 1/60th. How? Well, I live in Tokyo which is bathed in light. And I shoot with f/1.4 and f/1.2 lenses. Night photography is not all about city landscapes, which is all this guy shows in his video. If you want to capture people moving without them being a blur, how do you do that at night? No answers here. And one great piece of advice might be for people to ditch their crappy kit lens and go get a 50mm 1.8, which we all know for both Canon and Nikon can be as cheap as chips. People here above me mentioned star trails and very long exposure work in the country away from the city lights. Not mentioned at all here in this 'night photography' workshop. Plus, as someone rightly pointed out, that sort of work dictates smaller apertures. Partly for the detail, partly for the fact that at f22 and low ISO you will naturally increase the shutter speed which is what you are aiming for: to do everything possible to get as long a shutter speed as you can, i.e. lower the ISO, shut down the lens. Basically photography is about figuring out the interaction between aperture, speed and iso and tailoring that to every given situation. If one isnt doing its thing to give you the picture, change the other two accordingly. If you are going to do a night photography workshop then cover all kinds of night photography, not just the 'I am out walking after dinner in Sydney and need a sharp picture of the Harbour Bridge' style night photography. Sure, that might be what a lot of people want to shoot better but why not, at the same time, introduce them something new in the subject department as well? And if you aren't going to do that, call it a City Landscapes at Night workshop. Yes low ISO so you have low noise. When you raise your ISO for long night exposures the noise becomes very evident. I just couln't stand to watch this video. Why did he say a few words then stop and white circles would circle his nose? My own question now: Why use low ISO on night photos? Is noise much more obvious on those kind of shots? I'm a big fan of night photography as well. I'm lucky to live close to downtown Montreal, which is a great city, with a small mountain (Mount Royal) on which you can go to get spectacular views of the city. You can also do some fascinating exposures using a combination of ambient light plus "painting" parts of your scene with a flash (while standing outside the range of the camera, of course). Some of these night photos were shot using this technique: http://www.flickr.com/photos/21304695@N00/sets/72157603724283590/. One tip: If you're shooting fairly close-up on a subject that is lit by mercury vapor or tungsten street lamps, you may need to go with a custom white balance on your DSLR to avoid getting a greenish color cast. The way to set custom white balance varies by camera manufacturer, but on my Canon it involves first photographing a white piece of paper under the lighting conditions you're dealing with, so the camera knows what "white" is and can adjust the color palette of your images acccordingly. I'm a French-speaking photographer and I have a small vocabulary problem with some replies: what is a DOF? Who owns a dSLR and shoots in Auto mode? Things you need for night photography. This also works great for shooting fireworks. 3-5 seconds is typically what I use for shooting fireworks. Thanks for the video. Very helpful as well as other posters here. I have some night shots on my website in my out and about section of our city. Firt time ever shooting. I am hooked. Why does he encourage switching back to Auto afterwards? That makes no sense to me. With a fast lens and a high ISO speed, you'd be amazed with the shots you can take at night handheld and without a flash. f/1.4 and ISO 6400 gives you a lot to work with. The part 2 of the article should be out soon. This video is immensely helpful and addresses some specific problems I've faced. Now I know the solution -- thank you! Good video. The wide aperture will kill your DOF. If you're shooting skylines probably want something much smaller. Most important thing about night photography is to bring your tripod and shoot on LOW ISO. Removing the UV filter will also help with glare from street lights. That was a nice tutorial on night photography, but I think one important element was left out. You said there are two things that you need to address, exposure (by adjusting the f-stop or shutter speed) and camera shake. Those are totally correct, I just think on the first part one of the real important aspects of night photography now is the ISO-speed which can dramatically change the shutter speed you need. With newer dslr's using lower noise and available higher iso-speeds, an exposure that may have needed to be 1 second, can sometimes now be 1/60th at ISO-1600 or ISO-3200, close to being able to hand hold and shoot at night. Great video.